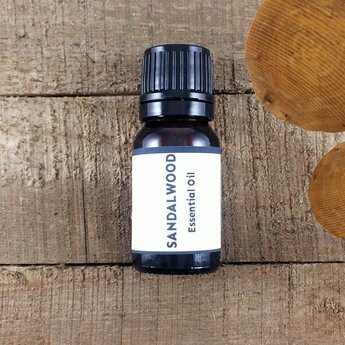 Sandalwood (Santalum spicatum) essential oil has a soft, sweet, subtle but rich, woodsy bouquet with a nutty, creamy undertone. The odor effect is calming and anti-depressant. It is also a reputed aphrodisiac. This divine oil has been used as an oil during spiritual ceremonies from ancient time to today. This is a 10% dilution in a base of fractionated coconut oil. Diffuser: Sandalwood is great to add to a diffuser to improve spirit (add frankincense), mend the heart (add rose) and to enliven the sexual mood (add jasmine or ylang ylang). Add to a blend of oils as a base to a perfume as a fixative. Sandalwood bring out the scents and makes for a nice undertone. Atlas cedar, bergamont, forest pine, frankincense, juniper, lavender, patchouli, rose, ylang ylang, vetiver. Fun facts: Temples were built in India out of sandalwood due to its scent and insect repelling properties. The Indian government owns all sandalwood trees in India and will only allow the extraction of the oil once the tree has turned 30 years old.